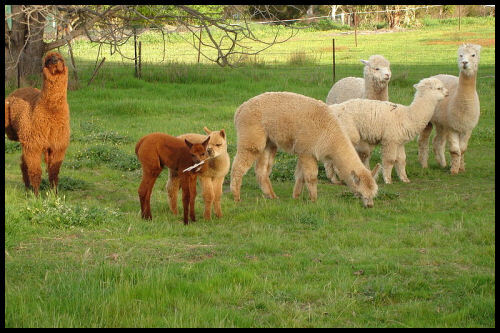 The Alpaca is a member of the New World Camelid family. Alpaca fleece is warm,soft, durable, luxurious and silky natural fiber. Some Alpaca have heavy guard hairs which need to be removed during processing in order to make a softer, finer finished product. Alpacas come in 22 natural colors with more than 300 varying shades! If that isn’t enough, alpaca fiber can be dyed easily to produce a world of color limited only by your imagination. Typical micron count for an Alpaca ranges between 18-25, with the smaller diameter producing a finer quality yarn. Alpaca can be spun by itself or can be easily blended with various types of fiber such as merino, silk or bamboo, to create a unique and wonderful finished product.